In the best scenarios, socialization starts from your pup’s day of birth. It’s never too early to start socializing your puppy inside your home. New research has changed standard veterinary recommendations regarding when to start puppy socialization classes. Never take your puppy to a dog park before he has received all of his vaccines. The good news is that if you got your puppy from a good breeder, the likelihood is that his socialization has already begun. He has likely (and hopefully) had good interactions with his parents and his littermates, as well as with the breeder(s) and their family and friends. He may already have had an opportunity to interact with children or other family pets. He’s likely already heard many common household noises – including doorbells, vacuum cleaners, and hairdryers. Plus, he’s had his paws on a variety of different surfaces, too. 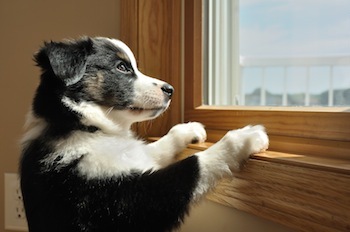 This is a great and very important start, as the most crucial socialization “window of opportunity” for dogs closes at around 12-13 weeks of age (some studies put it a little later at 16 weeks). That’s right – weeks! Sadly, if you got your new pup from a “backyard” breeder or a pet store (many of which get their puppies from horrific puppy mills), he likely came to you without having any of this important initial socialization. This is not ideal but, as you can see from the 12-13 week socialization period mentioned above, you still have time in that crucial socialization window of opportunity (depending on your pup’s age when you got him). If you adopted your puppy from a shelter, your puppy may have been fostered with his litter and mom at a volunteer’s home. Depending on the program at the shelter, your puppy’s time in the foster home may have included dedicated time for starting his socialization off on the right paw. There is no debate regarding the timing of this phase of socialization. You can, and should, start from the day your new pup comes home with you. This is where you’ll help your new puppy become comfortable with the typical sights, sounds, smells, and “feels” he’ll experience at home. These should include vacuum cleaners, people wearing hats, doorbells, other household pets, a variety of different floor/ground surfaces (carpet, tile, wood, grass, concrete, etc. ), and many other things. Again, you can learn more about the how and why of puppy socialization at the article linked to above. It’s this aspect of puppy socialization that has received more attention and study recently. And it’s a good thing too! The thinking and prevailing opinion used to be that puppies shouldn’t attend organized puppy socialization classes or be taken out into the greater public until after their entire puppy vaccination series was complete – which typically happens at about 16 weeks of age. The most crucial socialization window of opportunity ends at about 12-13 weeks, yet the vaccination series doesn’t end until about 16 weeks. There’s a chasm of disconnect there, and when it comes to preventing the development of many behavioral problems in dogs, that’s a problem. Yes, preventable infectious canine diseases such as Distemper, Parvovirus, and others are real and debilitating (and sometimes fatal) concerns, yet they are currently responsible for far fewer deaths than preventable behavioral problems. Now this, of course, is due in (very) large part to the wonderful advances of vaccines and disinfectants, as well as the fact that pet owners appreciate the importance of and get their pets vaccines. But it’s also because of these same advances and the relatively strong “herd health” conferred by these vaccines that we can, and must, start to take even greater steps towards minimizing and preventing the other side of the equations – the lack of socialization that is leading to the suffering, decreased quality of life, relinquishment, neglect, and euthanasia of far too many dogs each year. This is truly great news – and news that needs to spread. We’ve made great advances in combating and preventing many of the canine infectious diseases, now we can build upon those advances to start combating the bigger killer… behavioral problems. So, with this in mind, the best answer regarding the timing of organized puppy socialization classes is sooner than it used to be. Based on science and risk assessment, and so long as your pup has been given a clean bill of health to do so from your veterinarian, start your pup in such classes before 12 weeks of age, but only after they have had at least 1 dose of an intestinal dewormer and 1 week has elapsed following the first vaccinations in the puppy series. Since those first vaccinations in the series and the deworming dose would ideally be administered by your veterinarian, and since that initial veterinary visit typically happens at around 8 weeks of age, then most puppies should be able to start organized puppy socialization classes at around 9 weeks of age. This is, of course, on top of and building upon the crucial socialization that they should have already received while still in the care of their breeder or shelter, and the “in and around the home” socialization that you should be starting with them as soon as you bring them home. *Note that none of this changes the recommendations pertaining to dog parks and vaccinations. You should never bring your puppy to a dog park or other area where groups of dogs gather or many individual dogs frequent until your pup has received all of their vaccinations in their initial puppy series (around 16 weeks old). In these settings, the risk of disease transmission is just too high. The exception to this, of course, is your veterinarian’s office or local puppy training center, where strict cleaning and disinfection procedures are followed.